Your 2018 Dental Insurance Benefits: Use ‘Em or Lose ‘Em! Dental insurance is a worthy investment in your and your family’s lasting, healthy smiles. Unfortunately, billions of dollars worth of care are wasted each year in unused dental benefits. That’s because most plans renew with the start of the New Year — and anything that you have not used up will expire on January 1. As we near the holiday season once again, it’s important to act now to rescue your benefits. They’re on the chopping block! Dental insurance isn’t quite like your medical coverage. Rather, most dental insurance plans work sort of like a benefits plan that you use at the dentist’s office. You pay upfront for discounts on necessary care you can use throughout the year — the general, preventive, and restorative services that keep your smile healthy and clean. Each month, you will usually pay around $50 for an individual and $150 for a family. In exchange for this amount, you may be eligible for up to $1,500 worth of care after meeting your deductible. Getting as close to this annual maximum as possible is important for making the most of your benefits. Alternatively, when big treatments are needed, it may be wise to break them up over two benefit periods to reduce your out-of-pocket costs. If you have a health savings account (HSA) or flexible spending account (FSA), the greater portion of your leftover funds will be forfeited at the end of the year as well. This money is eligible for reimbursement on dental care and appliances, so consider replacing a mouthguard or scheduling a checkup and cleaning if you are in danger of losing money out of an HSA or FSA. Fortunately, you still have two months to take advantage of your dental insurance benefits. An in-network dental office can help you figure out what you are eligible for and what you are at risk of losing when they perform a verification of benefits. 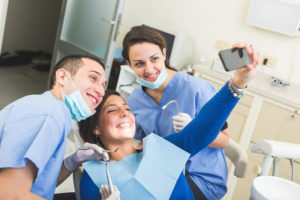 Then, they can help you make smart decisions about how to get the most out of your plan while reducing out-of-pocket costs on necessary dental care. The clock is winding down for 2018, but it’s not too late to take advantage of your dental insurance! You already pay for it, anyway — now don’t let that investment go to waste. Dr. Jayme Martinez and his team at Kessler Park Dental offer patients personalized attention and excellence in dental care. They encourage anyone with dental insurance to book a visit before the year is up — for the good of your wallet AND your smile. To get in touch with their office, go ahead and call (214) 303-9969 today. Comments Off on Your 2018 Dental Insurance Benefits: Use ‘Em or Lose ‘Em!